I'm holding out hope for some warm weather on this last summer weekend, still lamenting a lot of my summer things I neglected to wear. Why didn't I wear this dress more? Or this hat? Several dresses didn't even come out of the closet once. Could it be that I have too many, or simply that there are too few summer days? 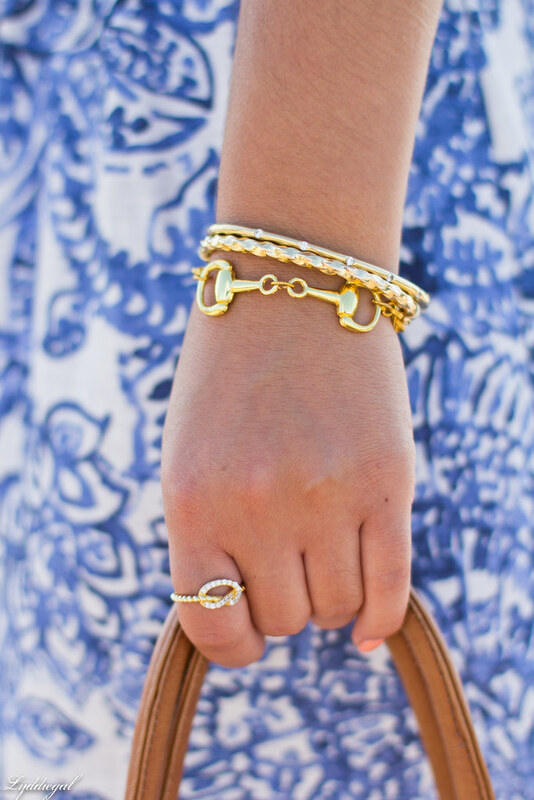 Have you entered to win $60 to spend at A Jewelry Crush yet? I adore blue and white and you look fab. Have a great weekend. How dorky is it that your title totally made me giggle? I love it. That dress is so pretty, I am tempted to go look for it at Target. Have a great weekend! Aw the end of summer "why didn't I"s. I know them well. This dress is very pretty and I bet would fair well in the winter too--minus slush. I love the hat! Come to think of it, I didn't get to wear my straw hat once this summer! Ugh! No I'm convinced there just isn't enough summer days! You can never have enough dresses! 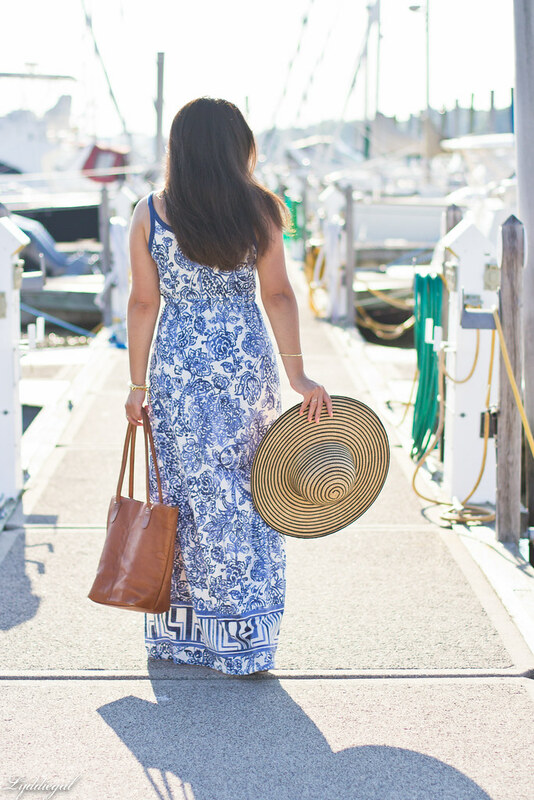 Love that dress on and it is perfect for your vacation closet. Enjoy the rest of your summery days. 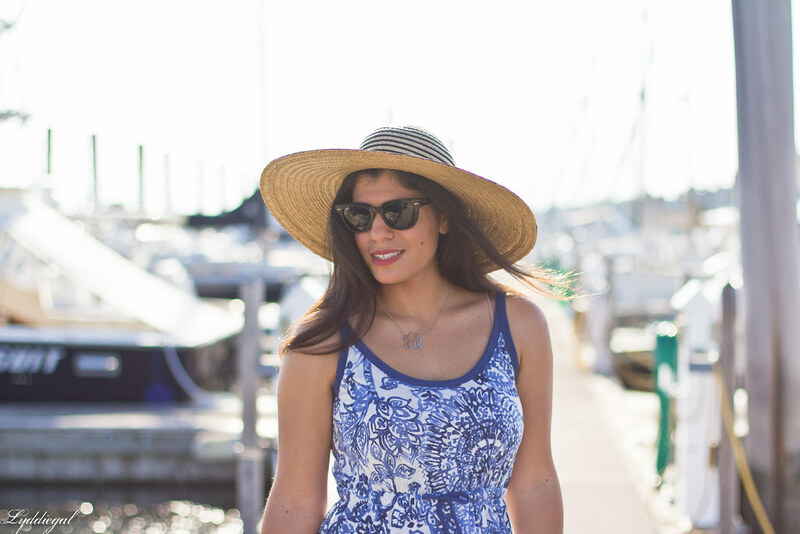 Ahh you are looking so gorgeous and perfectly nautical--why does summer ever have to end?! that is a gorgeous dress! Glad you finally found the time to wear it. Breezy and beautiful! You certainly are taking advantage of the wonderful weather! Beautiful blue and white print. I also love your hat! So nautical! I LOVE porcelain prints! What a gorgeous dress! I always find when the seasons change and the weather starts to call for different clothes that I never seem to have worn everything I own for that season - definitely a sign I have too many clothes! I know I've said this before, but I love white and blue prints! 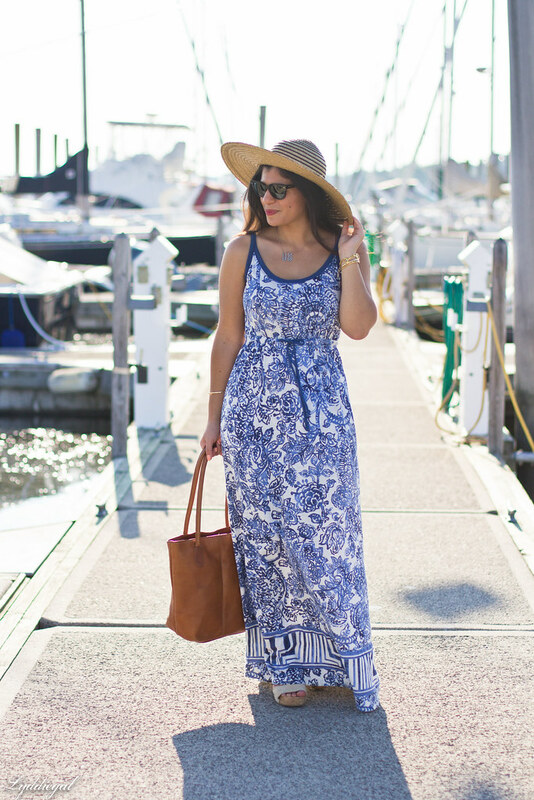 This is the most gorgeous maxi dress I've ever seen! Glad it got a chance to be worn this summer! Summer went by too fast for me! LOL I think I had two outfits I didn't wear. Love your dress Lydia. The print is gorgeous. What a beautiful dress to wear for the last weekend of summer! The color is amazing and I LOVE maxi dress. You look amazing! Wonderful dress, love the blue pattern! Yay for getting some more summer outfits in! I love the blue. I completely relate to your wardrobe laments, I always think summer's going to go on forever and then bam, it's Autumn already and I haven't worn lots of things I'd planned to. Such a lovely dress, the blue and white and the big hat make for a very striking look. Such a gorgeous dress! This summer was not too warm - I didn't get to wear some of my outfits either! 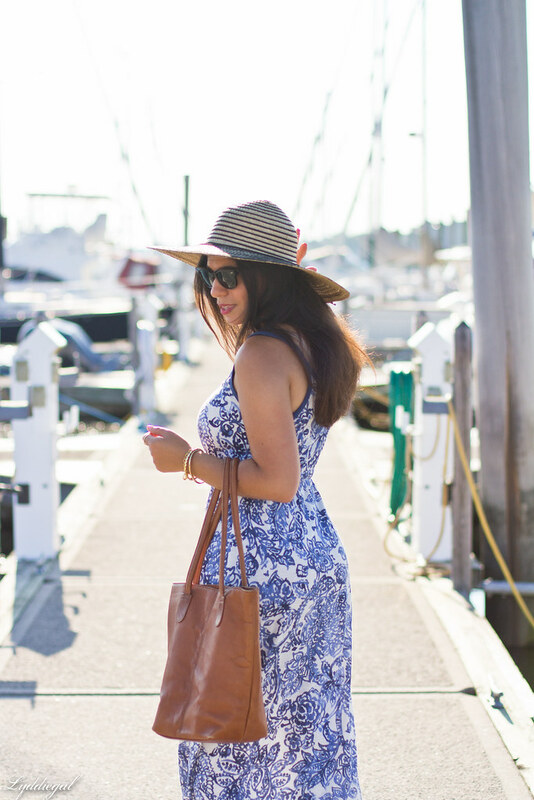 Lovely sun dress, blue and white are amongst my favorite colors! Lydia, I would say too few summer days. That is a beautiful dress though. The print of your dress is very beautiful and I love the location. The title of your post sure did make me smile. That dress is beautiful and looks fabulous with the hat! Too few summer days. 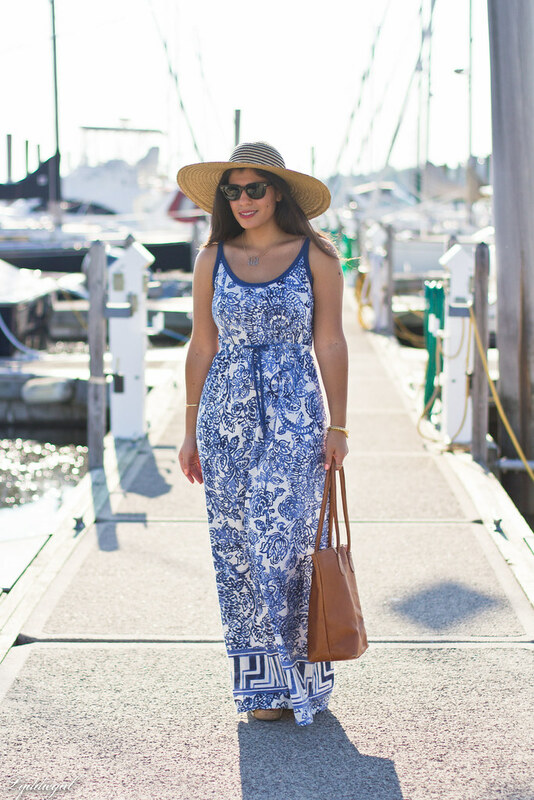 You look stunning in this gorgeous maxi. I hope you had great weekend. 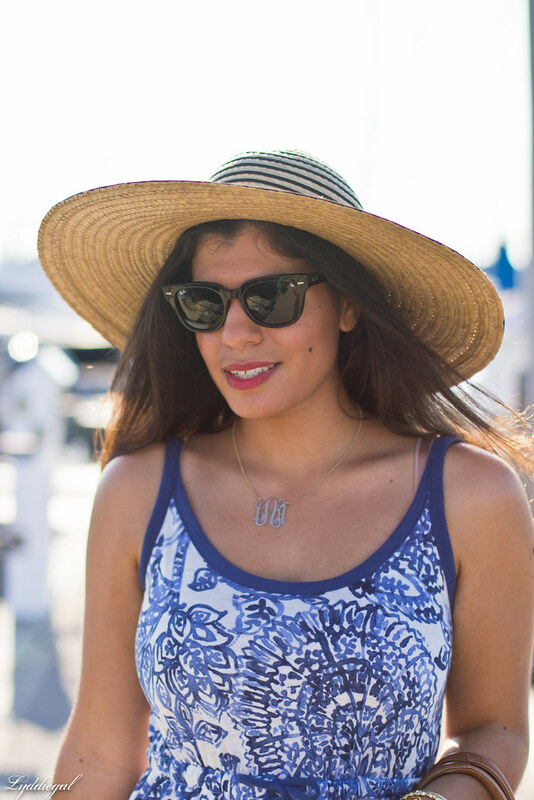 This is the perfect end of Summer look! That dress is gorgeous and so perfect with that hat! So pretty! I love the pretty color and print on that dress! I'm glad you got to give it a spin one last time this summer. We had a summer-like weekend too. I am going to say there's not enough summer days! 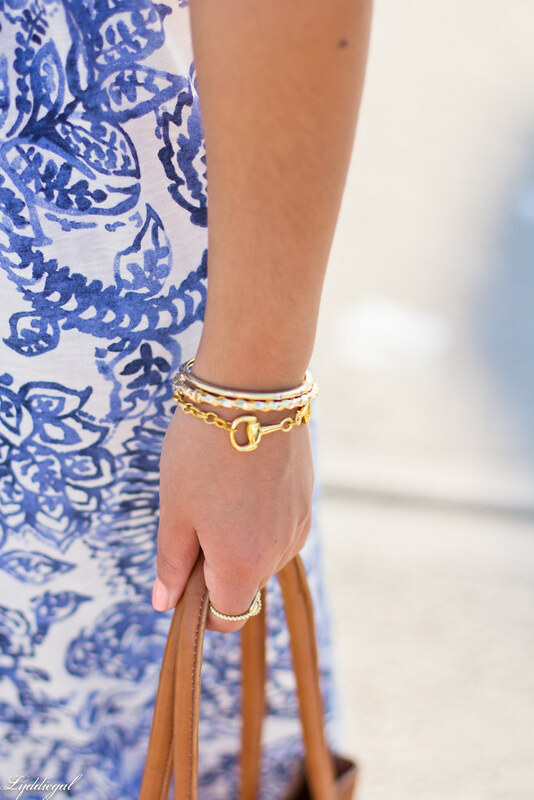 Love this dress and the pretty know ring. This print is just gorgeous and looks perfect on you! Eehehehe, any who! I absolutely love this dress--it reminds me of a dainty little teacup and all your accessories go along with it so so well. Hope you have a wonderful start to your week, Lyddie! Shame on you ! how could you have forgotten about this perfect dress ? There are probably just too few summer days ;) Many of my summer pieces only made it out of the closet once or twice this year - and I have a very small collection, summer not being my season - despite beautiful weather. I'm glad this dress got it's day, though, because it is stunning. The blue watercolour print on white has me swooning a little.